The countdown to Christmas is well and truly on! If you’re struggling to think of what to buy Aunty Val and Cousin Jeff then struggle no more. We’re offering 24 lucky people the chance to win spoiltpig goodies just in time for the big day. 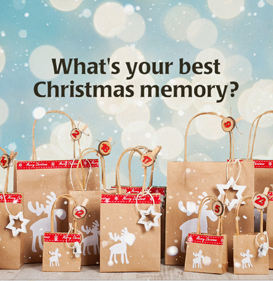 You simply need to share with us your cringeworthy or super cute stories and photos of Christmasses gone to be in with a chance to win! 1.Eligibility: This promotion is only open to residents of the United Kingdom (England, Scotland, Wales and Northern Ireland), aged 18 and over, excluding employees of spoiltpig, Denhay Farms Ltd (the “Promoter”) and all those professionally associated with this promotion. 2. Promotion Period: The promotion will run from 08:00 on Tuesday 6th December 2016 until 23:59 on Wednesday 14th December 2016. 3. To Enter: Visit the spoiltpig Facebook or Instagram pages and post your Christmas picture or story on the promotional post. Entrants are required to ‘like’ the post and comment on the post with their answer including a mandatory #spoiltpig within their comment. 5. The Prizes: A random selection of the following: spoiltpig trolley key, spoiltpig tote bag, spoiltpig fridge magnet and spoiltpig money off next purchase voucher. 24 prizes available. 6. Winner Selection: Within 1 working day of the promotional close date, 10 winners will be selected at random. Winners will have to have complied with all promotional requirements. 7. Winner Notification: Winners will be notified within 1 working day of the draw by personal message on either Instagram or Facebook (depending on their mode of entry). Winners will also be announced on social media posts. Winners will be required to respond confirming their address, email and telephone number within 2 days of initial notification. Failure to do so will result in an alternative winner being selected from all valid entries. 13. This promotion is in no way sponsored, endorsed or administered by, or associated with Facebook, Instagram, Twitter or Pinterest. You understand that you are providing information to the Promoter and not to Facebook, Instagram, Twitter or Pinterest. The information you provide will only be used for fulfilment of this promotion unless you have agreed to its use for any other purpose. By entering the promotion all participants agree to a complete liability release for Facebook, Instagram, Twitter and Pinterest.